In this blog, we'll cover several common misunderstandings in connection with accessibility problems on websites. Find out whether your website is doing it right or wrong. "Do I use the image as a decoration to create a visual context?" If this is the case, the image should not have an alternative text. "Do I use the image to provide information?" Then you need to describe what a visually impaired user can't see on the image (and this is not necessarily the same as describing what the image shows). "Does the image link?" Then you need to describe the destination of the link in the alternative text. A website's main areas need to be categorized by headings. This means that your web editors should always check whether H1 tags, H2 tags, etc. are used correctly, and they should be able to enter these tags if they are missing. If you wish to logically and visually highlight an area by using bold font/large font/another color etc. then this heading should also be highlighted code-wise so the heading not only functions visually, but also structurally. If you want to make sure that all users can identify and use your search field, and at the same time comply with accessibility guidelines, then you need to explicitly add text to the field through a label (the code label for="". If this is not possible, use title=""). This is not necessarily true. An audio reading tool might help some people with dyslexia, but most people with impairments or dyslexia use specialized assistive technologies. They need significantly more help than what a simple audio reading tool can provide. The web standards and guidelines for accessibility are created in order for user agents (browsers, assistive technologies etc.) to be able to interpret a website and render it in a meaningful way to the user. That is why the most important element when working towards ensuring accessibility is to follow the standards and guidelines. 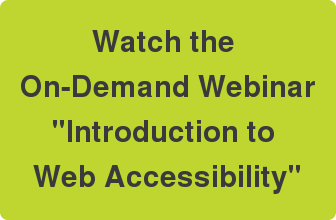 watch the on-demand webinar "Introduction to Web Accessibility".